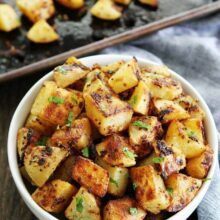 Mustard-Crusted Potatoes-an easy side dish that goes great with any meal! Pure Delicious has over 150 allergen-free recipes. There is no gluten, dairy, eggs, soy, peanuts, tree nuts, shellfish, or cane sugar in any of the recipes in the book. Don’t let that scare you because the recipes are still delicious, for real. Heather and her daughters were diagnosed with severe food allergies a few years ago, but that didn’t stop her from creating delicious food for her family. Her new cookbook is filled with delectable recipes that everyone can enjoy! Even if you don’t have food allergies, you will love this book! The photos are beautiful and the book is filled with healthy recipes and tips! And it is a nice cookbook to have around, just in case you have friends or family members that have food allergies. I always like to serve a few allergen-free recipes when I entertain because you never know who might have allergies. This cookbook is going to come in handy for dinner parties and special occasions! 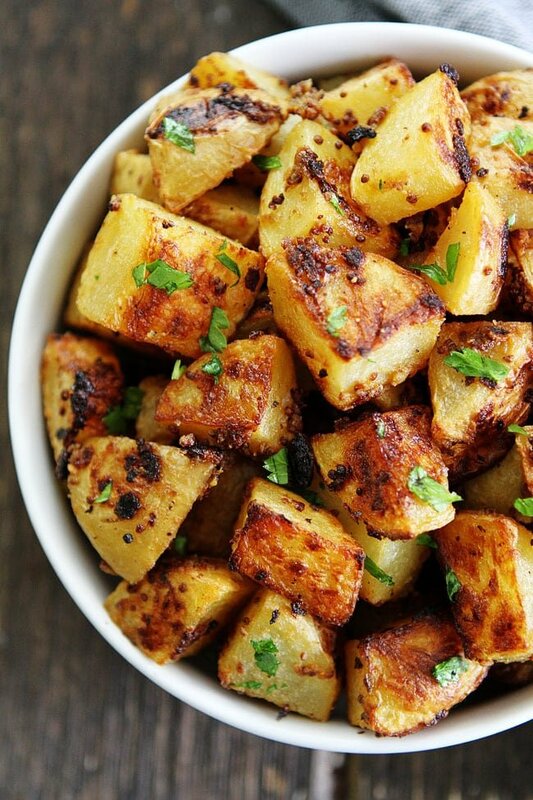 Let’s talk about the Mustard-Crusted Potatoes. 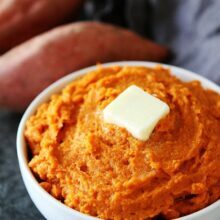 They are super easy to make and make a great side dish for any meal. Yukon Gold potatoes get tossed in a mustard lemon garlic sauce. 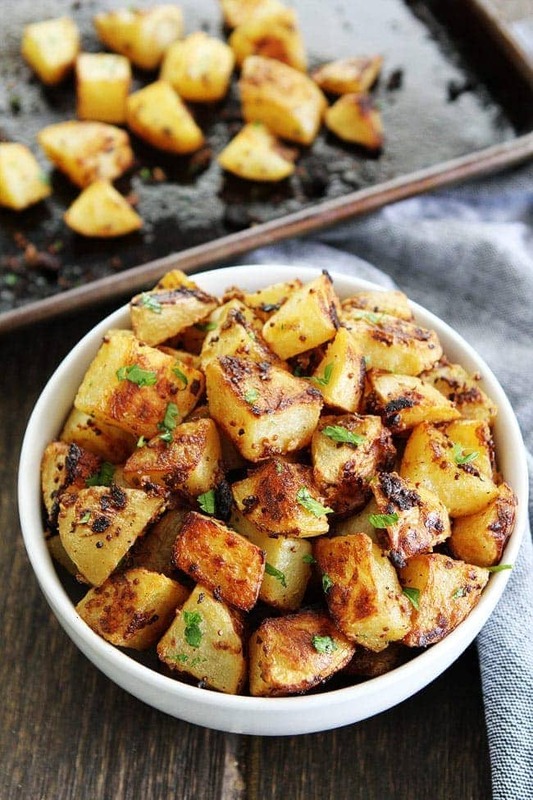 Roast the potatoes until crispy and add a little fresh lemon juice and parsley! I knew Josh would love these Mustard-Crusted Potatoes and I was right. He had two helpings. And guess what? My little boys loved them too! Caleb and Maxwell devoured their potatoes! 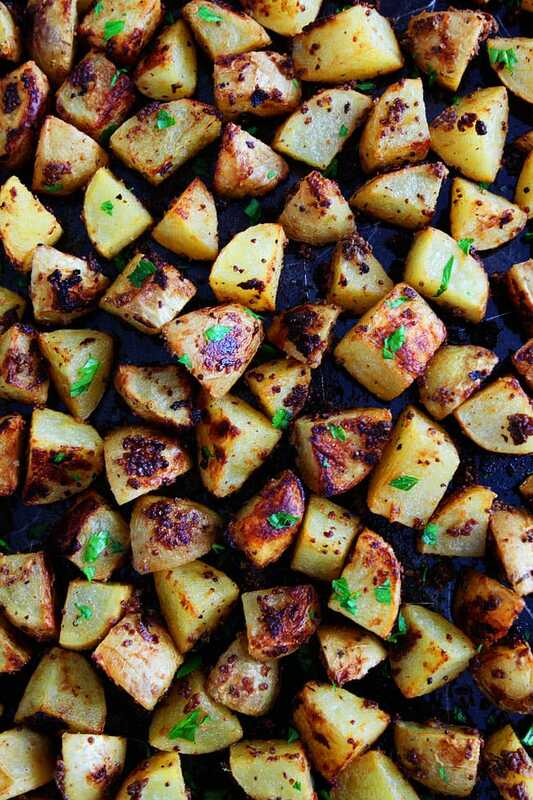 We are going to be making these Mustard-Crusted Potatoes on a regular basis. They were a hit! Congratulations Heather on your new cookbook! Make sure you check out Pure Delicious today! 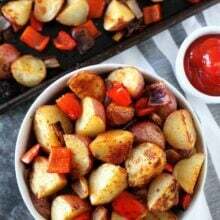 These potatoes are a great side dish to any meal! In a large bowl, whisk together the olive oil, mustards, lemon zest, lemon juice, and garlic. Add the potatoes and toss to coat with the mixture. Spread the potatoes on a rimmed baking sheet and sprinkle generously with salt. Bake for 30 minutes. 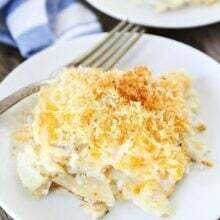 Toss the potatoes, return to the oven, and bake for 15 minutes, or until the potatoes are a deep golden brown and fork-tender. 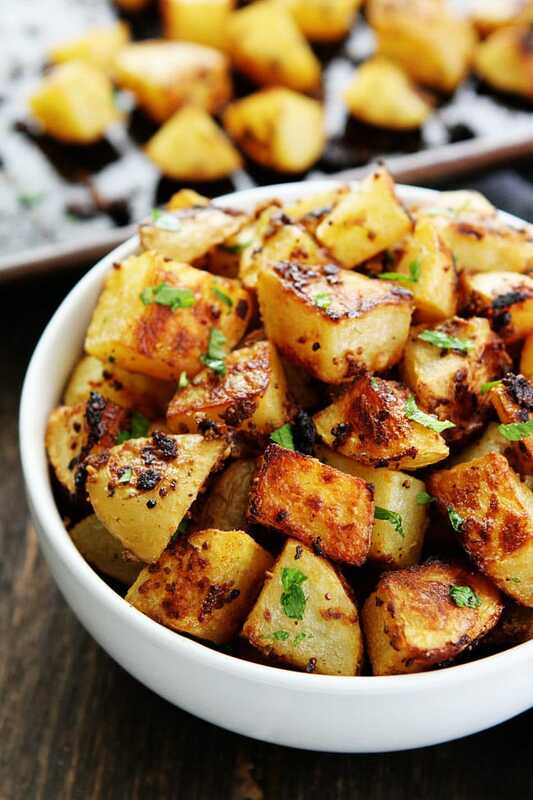 Transfer the potatoes to a serving platter, squeeze the fresh lemon juice over them, and sprinkle with parsley. Serve hot. Yum! 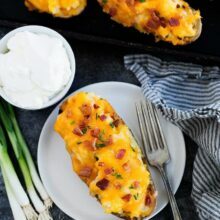 I love mustard too and these potatoes are calling my name 😉 Can’t wait to try this recipe! Well, we are actually a non mustard family, that is, wife never buys it and we’ve never used it in anything before! So I guess we’ll have to talk a walk on the wild side and try this. They certainly look super tasty. Wow – these potatoes sound so good. Thank you. I’ve never heard of whole grain mustard. Is this in a jar in the condiment aisle? It should be with the other types of mustards. Hey Maria these look so yummy! I’m a huge mustard lover, too! These look delicious! Oh Maria! Thank you so much! I love these potatoes (I am a fellow mustard maniac!) and am so happy that all of your boys enjoyed them. Thank you for sharing! These look SO good! I love how crispy the outside gets and I LOVE mustard!! I just stumbled on to your page and I was going to make some potatoes with steak tonight for the fam. – Gonna try this! Sounds delish. Can I do red potatoes ?? When we were newlyweds my husband made a mustard chicken for us that used similar ingredients. Serving these mustard potatoes alongside the mustard chicken would be a mustard lovers dream come true. I got so excited when I saw this because crisp oven-roasted diced potatoes are probably my favorite side dish ever! So simple, yummy, and perfect with almost any meat/seafood main. I usually roast mine with infused olive oil, herbs de provence, salt and pepper, then top with thinly sliced cheese (smoked gouda or fontina) and chives. But I’m always looking for new ways to mix it up, and the mustard sounds amazing! I’m also a mustard fanatic, so I’m excited to try these potatoes! I’m with John! The more mustard then better. And he is right. Folks don’t know what extra mustard means. These are great! Made them for 4th of July weekend and they were a big hit. Wow these are kind of potatoes I like thank you I will do them this afternoon. i’m with Josh… give me mustard. it sound like josh and i would really not be embarrassed by all the mustard all over our faces and fingernails. these potatoes i’m making tonight….